Did Rising Oil Prices Trigger the Current Recession? HomeBusinessDid Rising Oil Prices Trigger the Current Recession? Past oil price spikes associated with Middle East conflicts and OPEC embargos were each followed by a global economic recession. This column argues that the onset of the current economic downturn of is also partly attributable to a sharp increase in the price of oil. Moreover, the interaction of high oil prices and housing problems contributed to the severity of the downturn. Big oil price increases that were associated with events such as the 1973-74 embargo by the Organisation of Arab Petroleum Exporting Countries, the Iranian Revolution in 1978, the Iran-Iraq War in 1980, and the First Persian Gulf War in 1990 were each followed by a global economic recession. The price of oil doubled between June 2007 and June 2008, a bigger price increase than in any of those four earlier episodes. Blinder and Rudd (2009) argue that this oil prices hike had very different effects than those in the 1970s. But to what extent were these most recent oil price increases a factor that contributed to our current economic problems? In April, I presented a paper at a conference at the Brookings Institution entitled Causes and Consequences of the Oil Price Shock of 2007-2008 (Hamilton 2009). In that paper, I looked at both what caused the dramatic increase in oil prices and what role that oil price spike may have played in the subsequent economic downturn. The paper examines a number of different models that had been fit to earlier historical episodes to see what they would have predicted for US spending patterns and GDP over 2007-2008. The approaches surveyed include Edelstein and Kilian (2007), who examined the detailed response of various components of consumer spending, Blanchard and Gali (2007), who studied the extent to which the contribution of oil shocks has significantly decreased over time, my 2003 paper (Hamilton 2003), which emphasised the role of nonlinearities, and a model-free data summary of the observed behaviour of different economic magnitudes following this and previous oil shocks. Although the approaches are quite different, they all support a common conclusion; had there been no increase in oil prices between 2007:Q3 and 2008:Q2, the US economy would not have been in a recession over the period 2007:Q4 through 2008:Q3. One of the most intriguing calculations came from the forecasts implied by my 2003 model. I used those historically estimated parameters to find the answer to the following conditional forecasting question. Suppose you knew the path of GDP through 2007:Q3 and knew in advance what was about to happen to the price of oil. 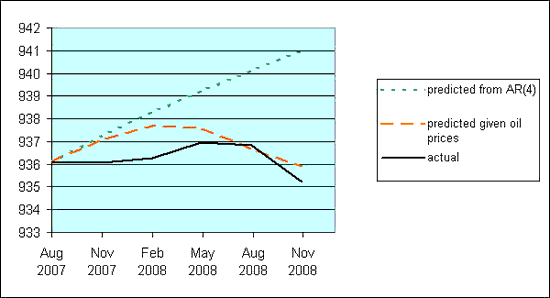 What would your GDP forecast be for 2007:Q4 through 2008:Q4? The answer is given in Figure 1. The green dotted line is the forecast if we ignored the information about oil prices, while the red dashed line is the forecast conditional on the huge run-up in oil prices that subsequently occurred. The black line is the actual observed path for real GDP. Somewhat astonishingly, that model would have predicted the course of US GDP over 2008 pretty accurately and would attribute a substantial fraction of the significant drop in 2008:Q4 real GDP to the oil price increases. Note: Solid line: 100 times the natural log of real GDP. Dotted line: dynamic forecast (1- to 5-quarters ahead) based on coefficients of univariate AR(4) estimated 1949:Q2 to 2001:Q3 and applied to GDP data through 2007:Q3. Dashed line: dynamic conditional forecast (1- to 5-quarters ahead) based on coefficients reported in equation (3.8) in Hamilton (2003) (which was estimated over 1949:Q2 to 2001:Q3) applied to GDP data through 2007:Q3 and conditioning on the ex-post realisations of the net oil price increase measure. Did oil cause the downturn? The implication that almost all of the downturn of 2008 could be attributed to the oil shock is a stronger conclusion than emerged from any of the other models surveyed in my Brookings paper, and it is a conclusion that I don’t fully believe myself. Unquestionably, there were other very important shocks hitting the economy in 2007-08, most notably the problems in the housing sector. But housing had already been subtracting 0.94% from the average annual GDP growth rate over 2006:Q4-2007:Q3, when the economy did not appear to be in a recession. And housing subtracted only 0.89% over 2007:Q4-2008:Q3, when we now say that the economy was in recession. Something in addition to housing began to drag the economy down over the later period, and all the calculations in the paper support the conclusion that oil prices were an important factor in turning that slowdown into a recession. There is also an interactive effect between the oil price shock and the problems in housing. Lost jobs and income were an important factor contributing to declines in home sales and prices, and the biggest initial declines in house prices and increases in delinquencies were in the areas farthest from the urban core, suggesting an interaction between housing demand and commuting costs. Once house price declines and concomitant delinquencies reached a sufficient level, the solvency of key financial institutions came into doubt. The resulting financial problems turned the mild recession we had been experiencing up until 2007:Q3 into a much more severe downturn in 2008:Q4 and 2009:Q1. Whether those financial problems were sufficiently insurmountable that we would have eventually arrived at the same crisis point even without the extra burden of the recession of 2007:Q4-2008:Q3 is a matter of conjecture. But it seems to me that oil prices indisputably made an important contribution to both the initial downturn and the magnitude of the problems we’re currently facing. It is also interesting that the observed dynamics over 2007:Q4-2008:Q4 are similar to those associated with earlier oil shocks and recessions. The biggest drops in GDP come significantly after the oil price shock itself. What we saw in earlier episodes was that the drops in spending caused by the oil price increases resulted in lost incomes and jobs in affected sectors, with those losses then magnifying other stresses on the economy and producing a multiplier dynamic that gathered force over subsequent quarters. The mortgage delinquencies and financial turmoil in the current episode are, of course, not the specific stresses that operated in earlier downturns, but the broad features of that multiplier process are surprisingly similar to the historical pattern. My paper concludes that the economic downturn of 2007-08 should be added to the list of recessions to which oil prices appear to have made a material contribution. Acknowledgment: The above was adapted from testimony by the author before the Joint Economic Committee of the US Congress and summaries at the website Econbrowser. •Blanchard, Olivier J. and Gali, Jordi (2007), “The Macroeconomic Effects of Oil Price Shocks: Why are the 2000s so Different from the 1970s?” 18 August. MIT Department of Economics Working Paper No. 07-21. •Blinder, Alan and Jeremy Rudd (2009). “Oil shocks redux,” VoxEU.org, 13 January 2009. •Edelstein, Paul and Kilian, Lutz, (2007) Retail Energy Prices and Consumer Expenditures, CEPR Discussion Paper 6255, April. •Hamilton, James D. (2003), What is an oil shock?, Journal of Econometrics, Volume 113, Issue 2. •Hamilton, James D. (2009), Causes and Consequences of the Oil Shock of 2007-08 NBER Working Paper15002, May.